The favors that were given to all of our guests at our 40th anniversary celebration were "Lovin' Spoons'" These were heart shaped measuring spoons. The girls thought of every little detail. During the renewal of our wedding vows, we exchanged gifts. Well, the girls worked us once again like puppets in this aspect of their planning. Sarah called on Mother's Day and said "Dad, there is a great deal on a ring for Mom. Should I get it?" Of course I said "Yep, that would be great!" After a few days I was thinking about the ring and I called Sarah and mentioned that I had an idea about contacting Kenny Fisher about renewing our vows during our July picnic. She said, "That would be fantastic!" Little did I know that she had already contacted Rev. Fisher a couple of weeks earlier and scheduled the ceremony for this past weekend. How easy I played into her plans! The ring was there at the ceremony. Sarah worked her Mom using a similar technique. She and Mom planned to give me another type of "rock". Everyone knows that I love rocks and Sarah had imported from California an engraved rock. This large rock is very heavy and now resides in our living room. How she worked us so that we would keep this secret from each other is amazing! It was truly a special and exciting weekend. When we pulled up to Kuzum’s Place at noon on Saturday for Sam’s Birthday Party, we entered the building and had a BIG surprise. The room was decorated with wedding bells and flowers. A Power Point presentation of our 1967 wedding photos was being projected on the wall. 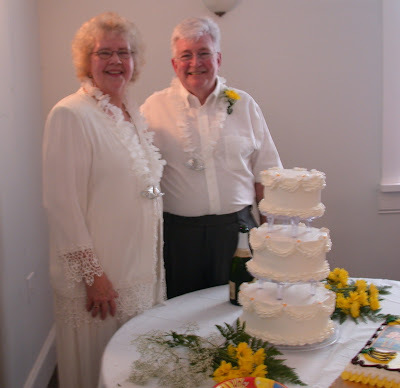 All folks were singing..”going to the chapel and we’re going to get married.” Those kids of ours did really surprise us with a 40th wedding anniversary party! What a party! It was amazing that that many of our friends and family attended since the weekend was a holiday. The party was catered by our favorite Italian restaurant, Minnards. Minard's supplied a wide variety of Italian dishes and, man, they were yummy. 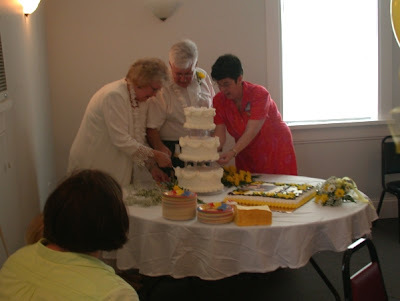 We soon noticed that the girls had duplicated our 1967 wedding with identical wedding flowers on the tables and even the cake was our 1967 model. We cut the cake and sipped champagne. The best thing was sharing this special celebration with friends and family. We are so blessed to have so many folks that care about us. Thank you all for taking the time to be with us on this wonderful moment in our lives. Yes, Sam was one year old on Saturday, May 26th. We traveled that morning to Bridgeport to celebrate Sam's birthday. Now the plan (we thought) was to arrive at Kuzum's Corner in Nutter Fort at noon and help decorate for the party which would begin at 12:30. 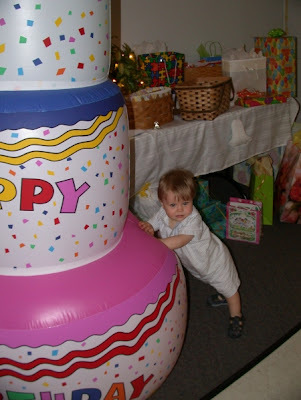 Judy and I wondered why Sam was having a birhday party with soooo many folks? We arrived about 1/2 hour early so Judy wanted to go to Kohl's and find a shirt for the Folk Festival. Sarah called and said to hurray that folks were arriving and we needed to put up Sam's balloons and other decorations. Boy, we were surprised!! I will tell you the magical tale tomorrow! Dad, your son is now overdosing on sugar! 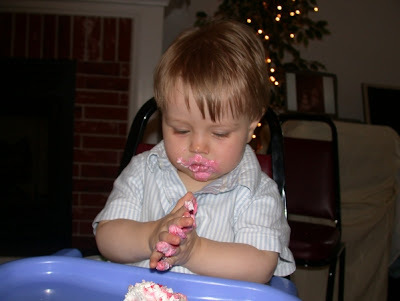 It was amazing to see Sam try his first piece of cake. He was a little hesitant at first, but he soon learned to devour every morsel! Notice how neat he was while eating this gourmet treat. This photo got my attention early this morning. 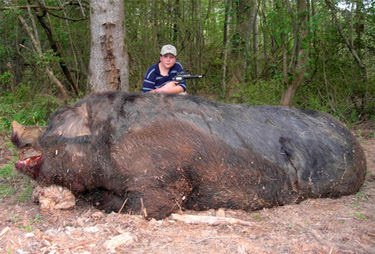 An 11-year-old boy, Jamison Stone - who lives in Alabama, used a pistol to kill a wild hog weighing a staggering 1,051 pounds and measuring 9 feet 4 inches from the tip of its snout to the base of its tail. Think hams as big as car tires! (1.) does his family have a hugh freezer. 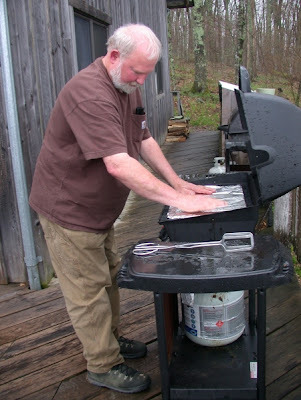 Or if they "can" the sausage, as it is done in these hills, can you imagine the number of Mason jars it would require? (2.) what family has enough relatives and friends to eat that volume of sausage? We have three jars of canned sausage (The canned sausage is certainly superior to frozen sausage.) and it will last us months. We try to limit our intake in order to watch our cholesterol levels. Hope you guys have a safe and happy Memorial Day holiday! 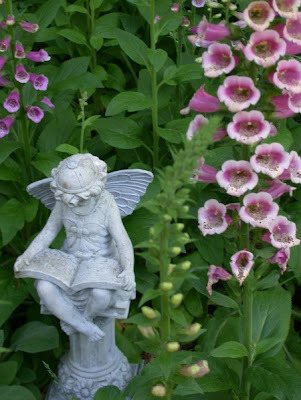 This is one of my favorite times in our gardens. The foxgloves are approaching full bloom. This flower was one of the favorites of my Grandma Davis. 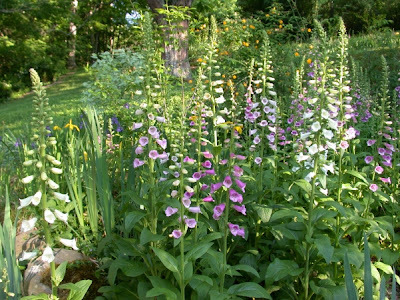 The majority of the foxgloves that are blooming in our yard came from Helvetia. We dug several plants along the creek bank. 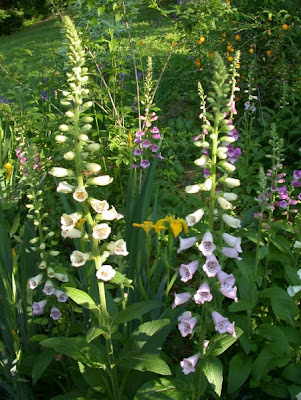 The Helvetia foxglove was first brought into the mountains by a local doctor. He, of course, used the plant as part of his "medicine cabinet." 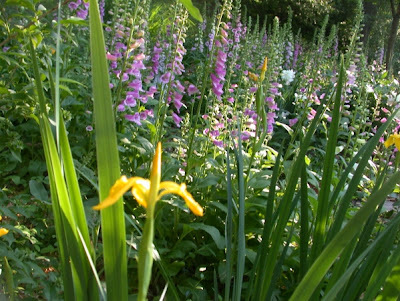 Medicines from foxgloves are called "Digitalin". 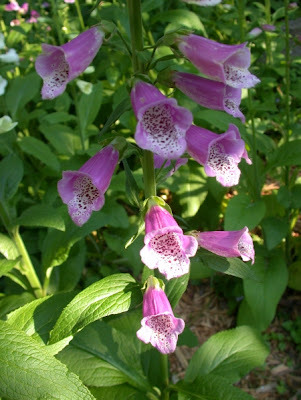 The use of Digitalis purpurea extract containing cardiac glycosides was for the treatment of heart conditions and to regulate the heart rate. This plant is a biennial so you have to wait until the seed pods form and then distribute the seeds around the ground. Thus far, we have had great success with these critters returning each year. Hark! These plants are extremely poisonous. The rule is ENJOY but do not eat. Even the deer stay away from this plant! OK, Grandpa says that there is something rotten in these hills. 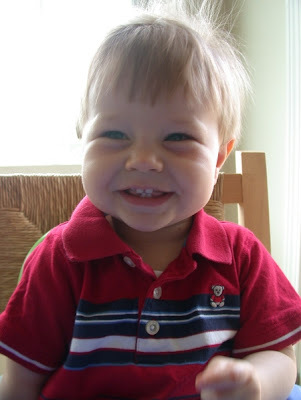 Sarah entered Sam in WVAQ's on-line cute baby contest. There were over 1050 applicants. They narrowed it down to ten! Sam is not in the top ten! How could that be? Guess all grandpas feel that way. 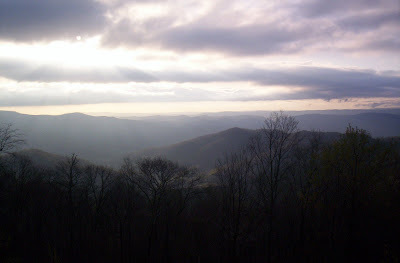 These shots were taken in North Carolina. Sam will be one year old on May 26th - this Saturday. OK, Judy, I posted some flowers yesterday, but I think your photo taken in Ritchie County this month wins the floral photo shoot. 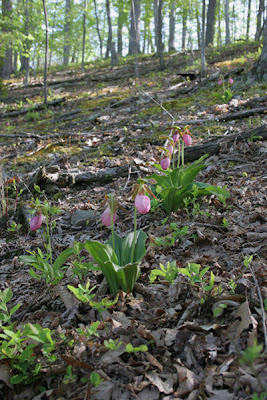 How wonderful are these Lady Slippers! 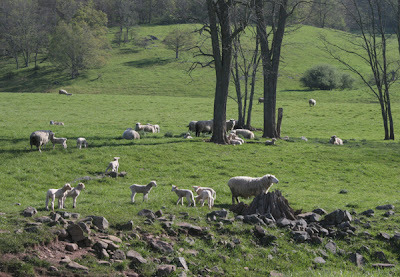 Thanks also to Judy for this great shot of the lambing season along Lobelia Road in Pocahontas County. What a great weekend! The warm spring days bring forth a plethora of flowers. The iris above and rhododendron below makes one appreciate the beauty and complexity of the natural world. What visual delights! The smells are equally as wonderful. The fragant lobelia below is a treat to the olfactory sense. Another Wonderful Photo of the Past! 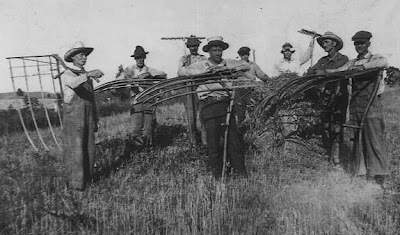 This photo was kindly shared by Terry Harris and probably taken in the early 1900's around Big Springs, Calhoun County. 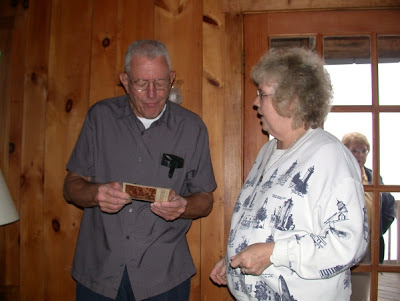 Terry explains, 'My great grandfather is Joseph Snider to the far left. My grandfather, Arnold Snider is third from the right. The others are all brothers and nephews to Joseph. Unfortunately, I never knew any of them. The Sniders owned a lot of property between Big Springs and Yellow Creek. The area was often referred to as Snider Ridge. " THANKS TERRY FOR THIS GREAT PHOTO! We did not see this great view because of the clouds last Saturday. Terry Harris took this photo the next day from the deck at the Cranberry Mountain Lodge in Pocahontas County. 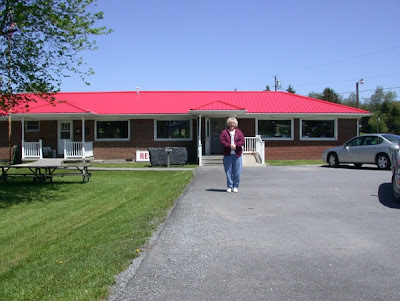 On Sunday, the folks took a short hike (5 1/2 hours) to find the Cranberry Mountain Information center! Along their paths, the crew came across these goodies. 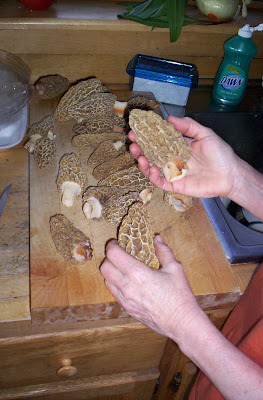 Morel time in the mountains! What are Elliott and Loretta cleaning? Well, ramps, of course! Sorry we missed the fine breakfast of ramps and potatoes with a side of fried morels. Yummy. Thanks gals for the photos. We were up at 7 A.M. and ready to head home. What a change in the weather! Sunday was clear and sunny. 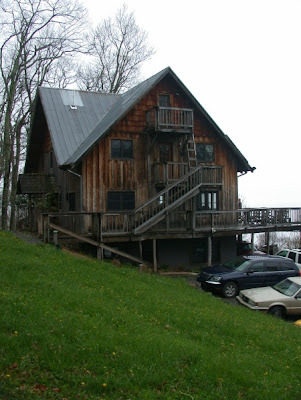 The folks at Cranberry Mountain Lodge can now see to Virginia! 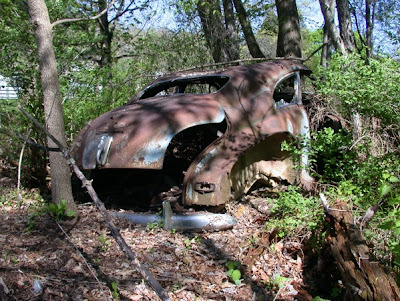 I took the photo below of the old 1930's vehicle that has been laid to rest in the back of the Seebert lot. One wonders what exciting tales this car could provide? It certainly still has character. After leaving, we made a short trip into Watoga State Park. The fisherpersons (How's that for political correctness?) were out enjoying this fine day. 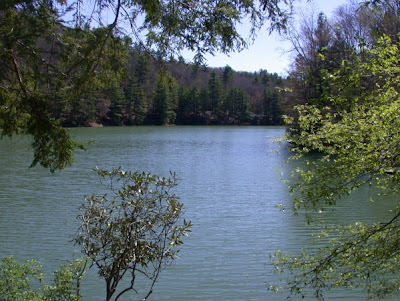 Lake Watoga has many pleasant memories. 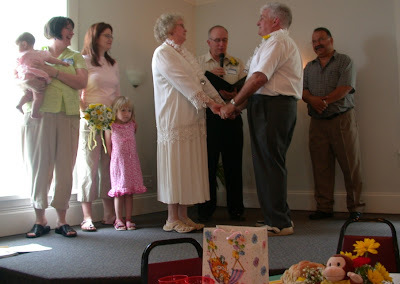 Judy and I started our married life together in Watoga. I was a naturalist in the park during the summer months. Bulletin for all you fine food lovers! 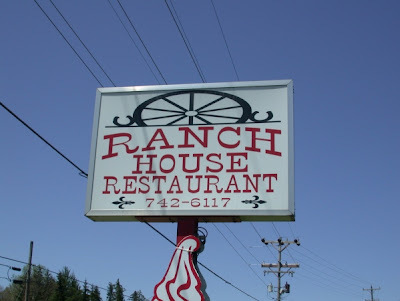 We can not pass Craigsville without stopping for a meal at The Ranch House Restaurant This Sunday I had their BBQ baby back ribs and they were super. We arrived home around 2 P.M. It was another fine adventure with Dan and Pix! 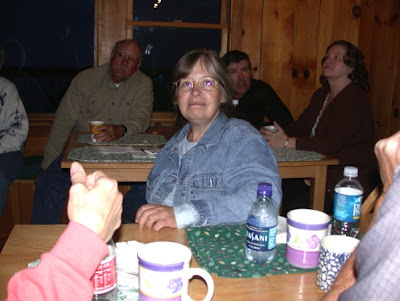 We arrived around 4 P.M. at the Cranberry Mountain Lodge. The clouds were forming around us. The mist always gives mountains a very special mystical quality. 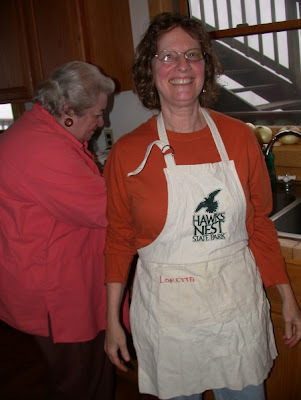 Loretta Gartman, who organized our reunion, is shown here ready to cook. Ann Gordon is at the sink preparing the yummy appetizers. 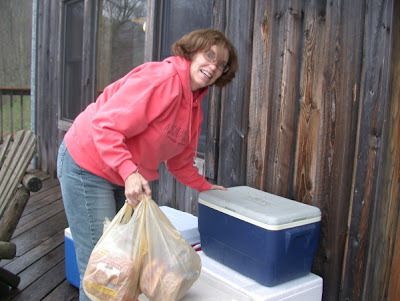 Loretta's husband, Don, was in charge of fixing the gourmet hot dogs and hamburgers. Terry Harris is helping Don organize the buns. 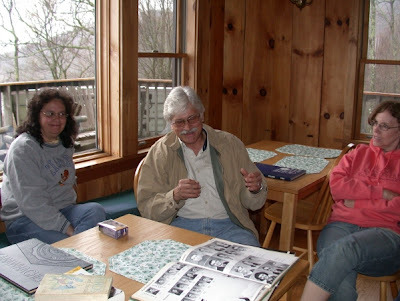 Wanda and Larry Parsons along with Terry review our old school yearbooks. 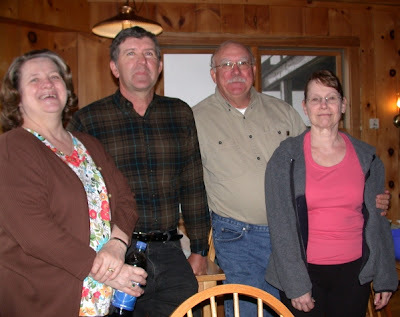 The Parsons live in Mason County and Terry in a Calhoun County resident. None of us has changed much since we graduated from college! Wonder what my wife is sharing with Sir Gordon? Could it be photos of grandkids? The award for the longest distance traveled goes to Judy Taylor. She lives in the Pacific Northwest in Washington State. On the left are Robert and Freda Jackson. They live in Pocahontas County. Robert taught school and now works for the Monongahelia National Forest. Beside the Jacksons are Elliot Workman, who lives in Delaware, and Linda Bush, who is a Jackson Countian. 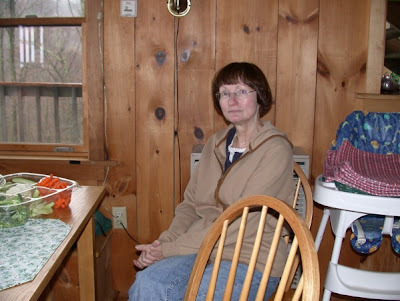 Here is our good friend Carolyn Kelly. Carolyn and I had many biology classes together. It was a great reunion! 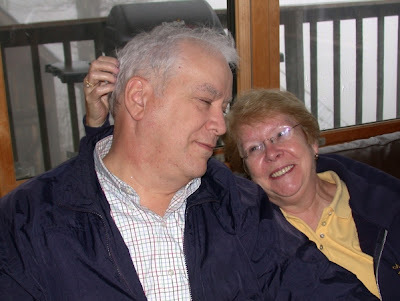 We have to leave Cranberry Mountain with this romantic couple, Dan and Judy (Pix) Schuda. As soon as we entered the Schuda's abode in Seebert, we all were off to bed. Yes, you can see that this weekend we were back with our friends, the Schudas, staying at their palace on the Greenbrier River in Seebert! 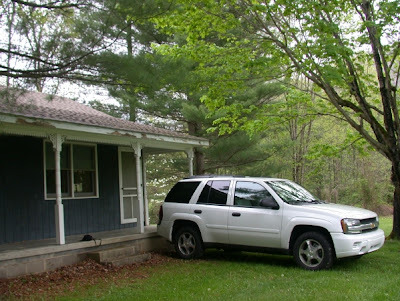 Dan drove this new 4-wheel drive that he and Pix rented so that we could climb Cranberry Mountain to attend a biology reunion honoring Bob and Ann Gordon. The Gordons were instrumental in our professional lives. 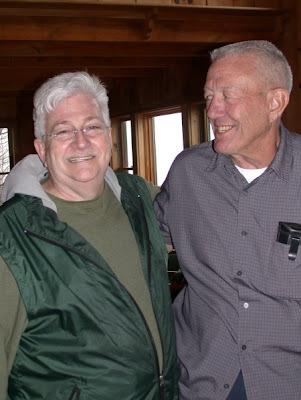 Bob instructed the zoology and genetics courses at Glenville State during the mid 60's. 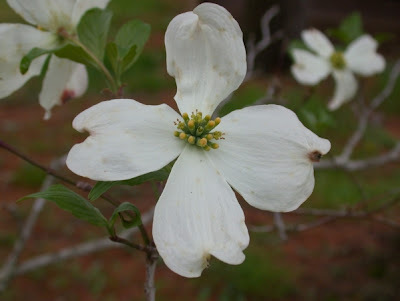 As we left the cabin on Saturday morning, I noticed that spring has come to the mountains - the blooms of the dogwoods and trillums were beautiful. We headed toward Cranberry Mountain in the rain. What a fantastic sight to see the valleys of the Lobelia area full of newly born lambs! 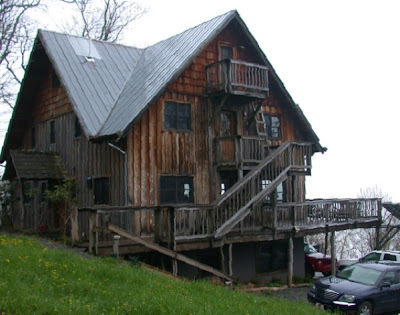 The Cranberry Mountain Lodge is located at 4,000 feet elevation on top of Cranberry Mountain. The lodge adjoins nearly one million acres of national forest. The views off the deck are spectacular, exceeding 40 miles. (That's what the folks say - but we were in the clouds this day!) The lodge is very isolated - the nearest neighbor being 4 miles away. 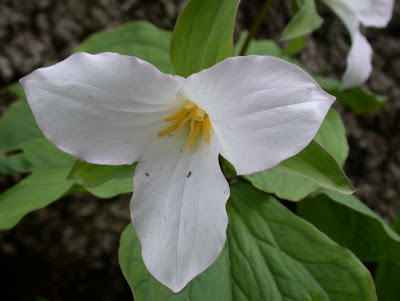 As we traveled the primitive mountainous road, the spring flowers were amazing! Ramps were also abundant. Tomorrow we will continue our reunion adventure.